Indonesia - In September 2015, large fires flared up in the forest, degraded lands and peatlands of Central Kalimantan, South Sumatra, and other parts of Indonesia. Fires continue to be lit. Between June and October 2015, fires have burned 2.6 million hectares of land. Fires in 2015 are estimated to have cost Indonesia at least $16.1 billion. The years 1997–98 also saw an especially strong El Niño event. At that time, fires burned across more than 6 million hectares of Indonesia, causing at least $8.5 billion in damages, mainly to forestry and farming. Haze from the 1997–98 fires is estimated to have resulted in around $4.5 billion in tourism and short-term health costs throughout the region. Both of the above estimates included very conservative estimates of the carbon cost. In 1997–98, carbon emissions were high enough to elevate Indonesia to one of the largest global polluters. Later work by CIFOR showed 1.45 billion tons of carbon dioxide was emitted in the 1997–98 fires, with a 2005 market value of around $3.6 billion. Given that the price of carbon is likely to rise in the long term, future fires could come at a much higher cost. Indonesia on fire again ... and again? This year’s smoke-producing fires seem set to be the worst since those of 1997–98, which were estimated to have adversely affected the health, property and livelihoods of some 75 million people in Indonesia and the region. Fire and smoke lead to a range of health problems, direct and indirect. The Indonesian National Board for Disaster Management (BNPB) is reported to have estimated that 500,000 people have developed respiratory symptoms because of smoke released by this year’s fires. The toxic smoke from forest and peat fires is a mixture of soot (particulate matter or PM) and various dangerous chemicals, including carbon monoxide, ammonia, cyanide, formic acids, formaldehyde and many others. The immediate health effects of smoke include headaches, dizziness, sleeplessness, confusion, and fatigue—all of which can substantially reduce productivity and exacerbate other illnesses. The longer-term health risks are less clear but are thought to increase the heavier the smoke and the longer the exposure. A 2013 study estimates that the 1997–98 smoke resulted in the premature death of around 11,000 adults from cardiovascular disease. The mortality of children (who make up more than half the region’s population) was not estimated but is thought to have been higher again. In Central Kalimantan, in mid-October 2015, CIFOR measured carbon monoxide levels 30 times higher than normal, indoors and more than 30 kilometers from the nearest fire. Indonesia’s Meteorology, Climatology and Geophysics Agency (BMKG) is reported to have said at least 43 million people on Sumatra and Kalimantan have been exposed to the toxic smoke. Under natural conditions, carbon from forest fires is removed from the atmosphere when vegetation regrows. When forests are cleared or peat burned, however, there is a net increase in carbon dioxide in the atmosphere. CIFOR research shows that, in 2013, one week of fires, mostly confined to Sumatra, produced emissions of greenhouse gases equivalent to 5–10 percent of Indonesia’s average annual emissions for 2000–05. 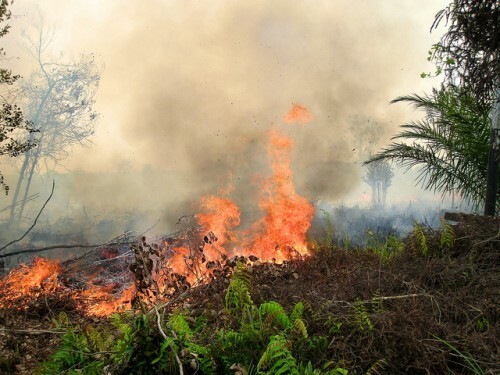 In 2005, peat fires accounted for about 40 percent of Indonesia’s greenhouse gas emissions. A recent analysis of the Global Fire Emissions Database suggests that daily emissions from peat fires since early September 2015 have, on many occasions, exceeded the daily emissions of the United States. The fire risk tends to worsen in drought years, and is exacerbated by climatic events in the Indian and Pacific Oceans. El Niño events, for instance, typically decrease rainfall in the Western Pacific. The latest forecast suggests El Niño conditions will persist until early 2016, exacerbating the risk of fire. Unchecked, global warming is predicted to substantially raise the frequency of El Niño events. Research by CIFOR shows that major air pollution events are no longer restricted to drought years, as deforestation and ongoing land degradation continue to make large parts of the landscape more fire prone. Recent estimates suggest the fires could add more than 1 billion tons of carbon to Indonesia’s emissions load. This has significant implications for the upcoming UN climate talks in Paris and for Indonesia’s target to cut emissions from the land sector by 29 percent below business-as-usual by 2030. Deforestation and forest and land degradation already threaten to many plant and animal species, including remnant orangutan populations. Hundreds of fires have been reported inside refuges and national parks on the island of Borneo, which constitute critical habitat for around a third of the world’s remaining wild orangutans. Wildlife organizations report orangutans emerging out of the forest to escape the fires, exposing them to the risks of direct contact with people. The Bornean orangutan is listed as endangered by the International Union for Conservation of Nature. Impacts on pollinating insects are likely very high. Enforcing legal restrictions on large companies has proven difficult,partly because of diffused responsibility across different levels of government and the judiciary. Assembling sufficient evidence to support legal prosecution is onerous.In the few court cases that have attempted to prosecute alleged illegal burning, both criminal responsibility and civil liability have been difficult to prove. Indonesia’s forest moratoriumprohibits authorities from issuing new permits for development on peatland. 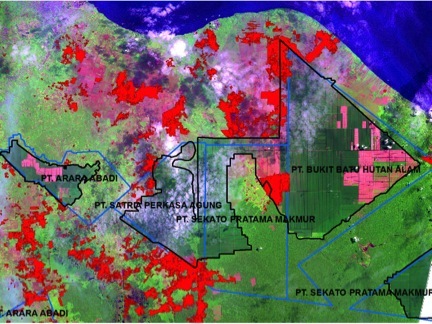 However, conversion to oil palm plantations can go ahead for concessions already awarded, including some on peatland. Oil palm and pulp and paper companies are making new environmental sustainability commitments, while novel mapping resources are increasing third parties’ monitoring capabilities. While several large palm oil companies have made commitments to more sustainable practices; however, the actions of staff and subcontractors on the ground may erode corporate pledges. Research from earlier yearsshows that some large companies have been willing to risk a fine, rather than pay for preventative measures. The roots of Indonesia’s fire problem lie in poverty and weak governance. They are not, in the first instance, environmental problems but human ones. The fires do not have a single cause. They are the result of activities by a network of different actors from the community, government, non-government, and private sectors. These groups operate across several different types of land: corporate concessions, state land and private/communal lands. In many cases, it is not clear who has tenure rights to the land. Tens of thousands of personnel dispatched to the fires have been unable to bring them under control. Firefighters are often ill equipped and poorly coordinated. Long-term solutions will take time to develop. Areas to focus on include avoiding forest conversion, reducing reliance on fire, and avoiding the cultivation of peatlands. Understanding the political economy of fire in Indonesia is key. Today, many different people benefit enormously from fires, including farmers, politicians, businesspeople, government officers, and even academics. This means the financial incentive to switch to alternative land-uses needs to be substantial. Fire suppression is important but itself may actually hamper long-term solutions, since it is highly visible, creates local jobs, and attracts funds and equipment. Not all fires cause damage and are unwanted; many smallholders rely on slash-and-burn agriculture for their livelihood. The long-term focus should be on providing Indonesia’s rural poor with fiscal support and competitive alternatives to fire-based agriculture.